We aren't planning on moving out of our apartment for at least another year, which means baby will be sharing a room with us. Her "nursery" is really just the front corner of our bedroom. Our apartment is about 600 square feet, which obviously isn't large. However, it has high ceilings and giant windows in every room, making the whole place feel spacious and light-filled. I put the following board together together to share my vision for what her space will become in the next few months. We already purchased the wooden dresser in the spring: this is where we plan to store all of her clothing, blankets and diapers. I love decorating with baskets, and will create a small changing station atop the dresser with basket organizers for diapers/wipes/lotions and the keekaroo peanut changer in vanilla. I conducted what feels like exhaustive research on changing table pads and chose this one because it wipes clean and doesn't necessitate any extra laundry from additional fabric covers. Moreover, I appreciate the simplistic, modern design. For the wall above the dresser, I'd like to hang a few pieces of art: I've been a long-time admirer of Sharon Montrose's baby animal prints (we already own the giraffe) and am thinking about purchasing one or two others to line up together. I'm obsessed with this metallic gold leaf garland and envision a simple gallery wall with the animal prints, garland, and, perhaps, a round, gold-toned mirror. I am enlarging some black & white photos from when Tiho and I were young and will likely frame those on a different wall in our bedroom. I especially adore this one of two-year-old Tiho in his toy car! We aren't buying a crib until she's at least three months old. Instead, we're going the bassinet route (and who am I kidding, we'll be bed-sharing, too). I absolutely love the classic look of moses baskets and will order a rocking stand to turn it into a bedside bassinet. I am becoming a crazy person researching eco-friendly and organic mattresses and bedding for the moses basket. I can't decide if it's better to purchase everything separately, which is more cost-effective (basket, mattress, sheets, rocking stand, etc.) or just buy a set like this. We shall see. The moses basket set-up makes the most space-saving sense to me, since it can be repurposed for toy/blanket storage later on. To round out the design, I included a few accessories I have my eye on: this adorable knitted teddy (made in France), a wooden toy camera (duh! 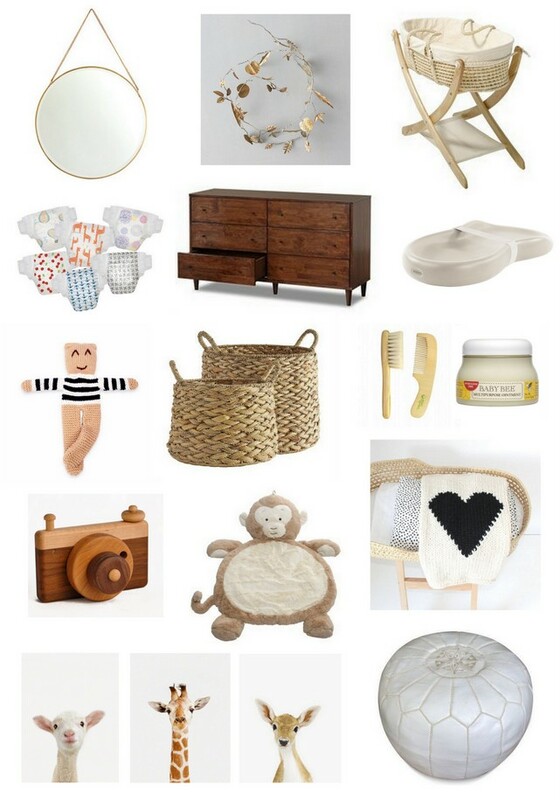 ), a plush play mat (Mary Meyer has so many cute options; I'm partial to the monkey and the lamb), a gorgeous heirloom knitted blanket, a tiny comb & brush set, and a white moroccan pouf to place in front of our glider (located in the living room). All in all, I want to create a space that works well for both the baby and for us. My personal decorating tendencies lean in the direction of "classic natural:" I gravitate towards the same style for little ones. (Beeping, plastic monstrosities, be damned!). I'll be sure to reveal the final result when it all comes together this fall. love it all! and honestly - you don't need much space...we're downsizing and the kids are now three! so excited for you. Thank you, Susan! I'm actually really glad we don't have an entire separate room to decorate at this stage. may fit into your nursery theme. It's a life savor come teething time! Yes...especially needy for child nursery as well. I think this would be the best collection for any nursery. My kids are studying in Mosaic Nursery which is situated in Dubai. This is a nursery with very big rooms and maximum 16 kids per class. There are well qualified teachers and they do creative activities. Thanks!